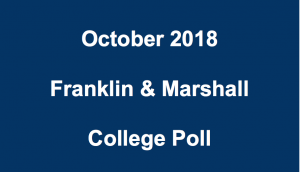 Franklin & Marshall College’s October poll shows comfortable leads for both Democratic incumbents Gov. Tom Wolf and Sen. Bob Casey in their reelection bids against GOP challengers Scott Wagner and Rep. Lou Barletta. The poll also shows an increase in interest in both parties for this election compared to previous months polls. Wolf leads Wagner 59% to 33% among likely voters, while 5% remain undecided. Franklin & Marshall states that “the dynamics of the race have shifted considerably in favor of Governor Wolf” compared to September’s poll. Wagner currently holds a -20 net favorability rating, which is a considerable drop from September’s poll that had the GOP candidates net favorability rating at -9. Remaining rather consistent with previous polls, 54% believe that Wolf is doing an “excellent” or “good” job as Governor, while 28% believe he is doing a “fair” job, 16% say a “poor” job and 3% don’t know. 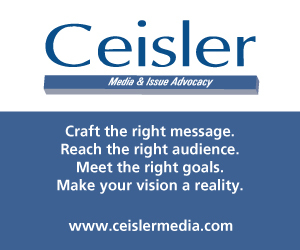 Casey leads Barletta 50% to 35% among likely voters, while 15% remain undecided. Franklin & Marshall states that “the dynamics of the race have changed little since our prior surveys,” although one significant change is the percentage of voters having an opinion on Barletta. 36% still “don’t know enough about Mr. Barletta to have an opinion,” while in September’s poll that number was 51%. Remaining consistent with previous polls, 43% believe that Casey is doing an “excellent” or “good” job as Senate, while 25% believe he is doing a “fair” job and 23% say a “poor” job. The poll, surveying 537 Pennsylvania registered voters, included 254 Democrats, 211 Republicans and 72 Independents from October 22-28. The margin of error for this survey is +/- 6 percentage points. As is the case with most races across the nation, President Donald Trump is impacting the way Pennsylvanians select their Congressional representatives in 2018. 69% of those who plan to vote for a Democratic congressional candidate are casting their ballot as a vote against Trump and the Republicans in Congress, while an even larger 83% of those polled who plan to vote for a Republican congressional candidate are doing so in sign of support for Trump and the GOP members of Congress. In this poll, 36% believe Trump is doing an “excellent” or “good” job as President, while 12% believe he is doing a “fair” job and 52% believe he is doing a “poor” job. 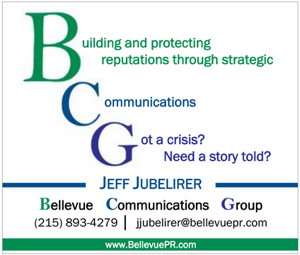 The eyes of the nation will be on various Pennsylvania races next week that may determine who controls the House of Representatives for the next two years. 53% of registered voters prefer the Democratic candidate for Congress, while 38% prefer the Republican candidate. Despite the Democrats edge in this category, Republicans hold a narrow enthusiasm gap in this poll. 75% of Republicans say that they are “very interested” in the election, while 73% of Democrats say they are “very interested.” Just last month, the Democrats held a 64-58 edge of the GOP in this category. Interest in the election is higher for Democrats, Republicans and Independents than it was in August or September. The last poll F&M released before the 2016 election, based on the results of interviews conducted Oct 26-30, 2016, both showed Sec. Hillary Clinton and Democratic Senate candidate Katie McGinty holding double digit leads over Trump and Republican Sen. Pat Toomey. The poll showed Clinton leading Trump 49% to 38% and McGinty leading Toomey 43% to 33%. Both polls were towards the left end of many public polls leading up to the 2016 election. However, F&M’s polling this year is nearly identical to the Real Clear Politics average of Casey up by 15.5 points, although the RCP average for Wolf’s lead is 17.7 points. Too bad the GOP has been taken over by your daddy,Trump. I am voting for Wagner, as I way good by to the democratic party. I am done with their liberal policies. Good. The GOP is going to get what it deserves on Tuesday for putting up particularly nasty candidates. Go Casey!! Hey Wagner: ask the Gov if he is still going to continue to refuse to enforce the existing law on the death penalty, the law he took an oath to uphold. If not that means convicted cop killers and mass murderers get a break from the Gov. That is an insult to the victims families and to all law abiding people. The bigger question is: how are you not discussing it as well as sanctuary cities and illegals. Thats what people want to know about, not the same old promises every politician makes. The polling seems to be in disagreement with you. So sorry! Now, you Breitbart and Fox culties, yes, that is what you want to talk about. The GOP would be in a better position with either Mango or Ellsworth. Wagner is a joke and he’ll drag the rest of the ticket down. Good riddance.